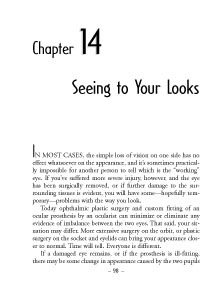 In this chapter, Mr. Brady discusses something that for some may be the main concern following damage to an eye: changes in personal appearance. "If the damaged eye remains, there may be some change in appearance caused by the two pupils not tracking precisely in unison. The eyes may seem perfectly aligned when looking straight ahead, but diverge a bit when the good eye glances to one side.